Joyce Holder Brooks, age 86 of Clarkesville passed away Sunday, May 20, 2018 following a period of declining health. 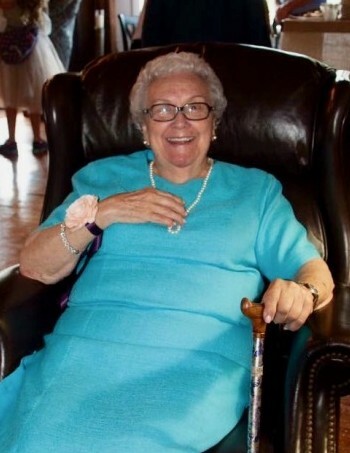 Born on May 10, 1932 in Cochran, Georgia, Mrs. Brooks was the daughter of the late Willie and Opal Goodman Holder. She was a school teacher in the Houston County School System and she was a member of Bethlehem Baptist Church in Clarkesville. Mrs. Brooks was known for her beautiful voice. In addition to her parents, Mrs. Brooks is preceded in death by her husband Robert “Bobby” O. Brooks. Survivors include sons and daughters in law Boyd and Laurie Brooks of Demorest and Mark and Page Brooks of Clarkesville, grandson Rev. Seth Brooks (Traci), granddaughter Sarah Alice Brooks, grandson Aaron B. Brooks (Hannah), great grandchildren Scarlett Brooks and Haddon Brooks. The family will receive friends at the funeral home on Tuesday, May 22, 2018 from 6:00 until 8:00 PM. Funeral services will be held on Wednesday, May 23, 2018 at 4:00 PM at Hillside Memorial Chapel with Dr. Craig Ward and Rev. Seth Brooks officiating. Graveside services will be held on Thursday, May 24, 2018 at 11:00 AM at Perry Memorial Gardens, Perry, Georgia.